On Christmas Day, just before noon, the call went out for a reported dwelling. 8404, who just happened to be at the residence next door, stepped outside, reported heavy smoke, and accounted for all occupants. Upon 8602's arrival, the All Hands was struck. 8404 and his son, a junior firefighter, retrieved a hydrant wrench from 8602's vehicle and began flushing the hydrant in preparation for the first arriving apparatus. Quint 85 arrived and stretched two 1 3/4" lines, one through the front door, and the second to the Charlie side. 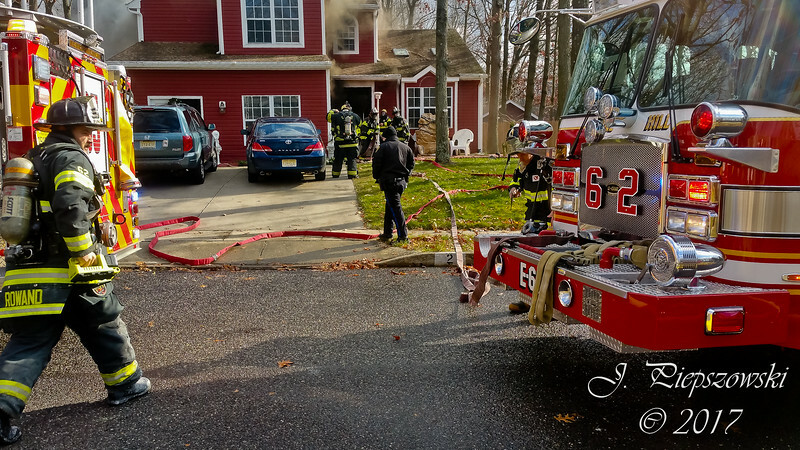 Engine 62 arrived just after and stretched a third line, also through the front door. Squad 86 arrived, secured a second water supply, and placed a fourth line into service to aid on the Charlie side. Crews operating inside encountered heavy fire and smoke throughout on both the first and second floors. It was soon learned that there was also fire in the crawlspace below and behind the interior crews, and the decision was made to order the emergency evacuation. Crews operated defensively for a time before re-entering the structure to finish knocking down the fire. It was placed under control after 45 minutes. No injuries were reported. The family dog did not survive, however a missing cat was located alive during overhaul. The fire is believed to have started with the dryer, and is under investigation.